Craig saw my Fusion 360 first impressions and wrote in to clarify some functionality I’d missed. He has kindly agreed to let me publish our correspondence. > Parameters have to be defined in advance (Modify > Change Parameters); they cannot be created on the fly by dimensioning something as, e.g., width = 10cm This is infuriating, especially since there’s no way to leave the parameters window open while editing features/sketches. It is indeed a bit annoying, but what I do is to just pick a number and then pop open the Change Parameters window (using the "s" key shortcut, which is awesome). 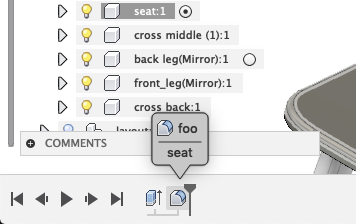 You can not only create new parameters but you can edit the individual features' settings. Probably you already knew this and still find it annoying. Since my last modeler was Sketchup, for me it's awesome to have parameters at all and I find this workflow to be reasonably convenient. Hopefully they'll move to something like what you're talking about in the future, as it would clearly be better. > I’m not sure how to tell when sketch geometry is under-constrained (unlike Inventor, which helpfully draws constrained points/lines in purple and unconstrained in green). It wouldn’t surprise me if my chair has a few underconstrained bits, which makes it feel even more necessary to manually backup/version things, lest an accidental drag/drop mess something up. Lines are blue if under-constrained, black if fully constrained. Dots are hollow when under-constrained. Purple means something but I forget what. Projected? Try Shift-N. It toggles coloring both of the parts and of the timeline. And the timeline really can't be hierarchical, because it's chronological and you can move in and out of components, creating dependencies. If you tried to represent that as a tree you'd lose the sequentiality. The coloring really, really helps: try it. Your other complaints seem to align with my understanding of Fusion. It's definitely not perfect, but man is it ever a step up from SketchUp. Hopefully they will continue to improve it. Thanks for writing, it's great to hear from you! Definitely agree --- I much prefer parametric tools to things like SketchUp. What sorts of things are you modeling and building? It is indeed a bit annoying, but what I do is to just pick a number and then pop open the Change Parameters window (using the "s" key shortcut, which is awesome). Hmm, are you on Windows? On my version, pressing "s" opens up "model shortcuts" or "sketch shortcuts" (depending on the mode), which seem to be recently used operations. The Change Parameters window has no shortcut indicated. I did some Googling and it looks like shortcuts can be changed by hovering over menu items and waiting a few seconds for three dots to appear on the right; this opens up a menu that lets you change shortcuts. However, I can't reassign "s" (it's reserved by Fusion). Okay, thanks a ton for pointing this out. I did some more poking around, and it turns out the issue was that I never grounded my initial sketch in space (by starting at the origin point or using the "fix" constraint). That's a habit of mine in Inventor, but I must have missed it in Fusion because of interface differences or something. Once I did that, much of my geometry turned black. Re: dependencies, yeah, my guess is that they did a lot of testing and decided to try focusing the perspective on the individual designer ("you did these things in this order") rather the more traditional CAD part-focused perspective "this part consists of these operations, that part of these operations"). Anyway, thanks a ton for writing. I'd love to hear more about what you're working on and catch up in general --- let me know if you want to grab a call sometime, I'm pretty open the rest of this week. I'm on OS X. Just start typing. It auto-completes. So: "s" -> "Cha <enter>" should get you "Change Parameters". "s" is a superpower - I can't get the hang of the gestures thing, so I use s all the time. As an emacs guy command names fit how I think. One thing I found super helpful was, if something is blue, I just drag it around. It will quickly become obvious how it's underconstrained. Then I add constraints as appropriate. I'm not aware of that option, but yeah, I have never named a feature. Not that I'm expert - just started using it a few months ago and I'm hardly a full-time designer. Isolating components seems to be a very common way of working in Fusion. As you discovered, that limits the timeline and makes it easier to understand. One other thing that helps (and a real moment of revelation for me wrt parametric modeling) is the fact that you can drag features around on the timeline. I find that I tend to work that way a lot now - make history make sense after the fact. It is, as you say, like programming. Interesting - I'll have to think on that. It does seem fairly global, but I feel like you'd have to constrain the components themselves to get locality of action. Not sure if that makes any sense - it barely does to me. But I'm super new to real parametric modeling. Have done mostly direct modeling, and mostly actually in 3D graphics, not CAD.